The Steel Hull was designed by Marine Design International and built by Mooney Boats Ltd. The keel was laid for the vessel on Monday 14th January 2008 and vessel was launched and completed successful sea trials on the Wednesday 7th May 16 weeks from start to finish for complete build. 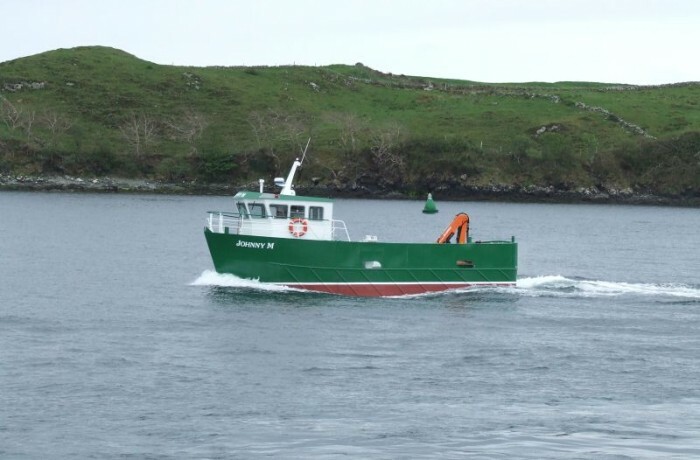 The vessel is been used on a salmon farm as a feed vessel and also for working on anchors and general service work. The hull will be built from Lloyds Grade A Shot-blasted and primed steel plate with transverse framing. The hull has been divided into 4 watertight compartments. Steering room aft with access from deck with flush mounted Baier Marine hatch. Two separated 1500 lt fuel tanks are built into the hull in this area also. Forward of this is there are 2 feed silos 1port and 1 starboard with separate flush mounted Hercules 2828 aluminium hatches. Capacity off silos is 5.3 tons each. Forward of the silos there is a large engine room which incorporates main engine and gearbox, hydraulic oil tank, deck wash pumps, hydraulic pumps etc. Forward of this there is a large storage area which is fitted with a toilet. This area could also be used for sleep accommodation but is not required on this particular vessel. Again just forward of this compartment is the chain locker which is accessed from the forecastle deck through a flush mounted Baier aluminium deck hatch. The Wheelhouse is of all welded steel construction and is accessed through door on the pt side which leads onto main deck. On the starboard side there is another store room for diving bottles and working equipment. The Deck crane is a Guerra Model No M90.90 M 3 with an Hydraulic outreach 11.4 meters with lifting capacity at 9.6m of 800kg fitted with 1 No GDW-090 Hydraulic Winch with brake. 5 No mooring bollards and cleats positioned 1 frd 2 aft and 2 midship. 1 Roller at stern midship deck level. 3 Access doors 1 pt, 1 Stb and 1 Aft for diving access. The Wheelhouse has been provided with good all round visibility and has been fitted with Seaglaze Series 10 & 11 clamp in windows and also 2 series 21 clamp in doors. 1 Skipper Chair Type Cab 300 mounted on steel pedestal. 1 Small Table with bench seating for 4 has also been fitted. Gearbox is Twin Disc MG 5061 3:1 reduction. Steering system is hand hydraulic heavy duty with emergency steering also provided. 5 x Rule 3700 24 Volt Electric Bilge Pumps. 1 x 1 ½” Jabsco 24 Volt Electro magnetic deck wash pump. 2 x Aqua Signal S/S Flood Lights 24 Volt. 4 x Aqua Signal Fluorescent Lights 24 Volt for Various compartments. 1 x Sets off 24volt starting and lighting batteries. 1 x 24 Volt Switchboard & Distribution board. 1 x Set of Distress flares (RORC). 1 x First aid kit. 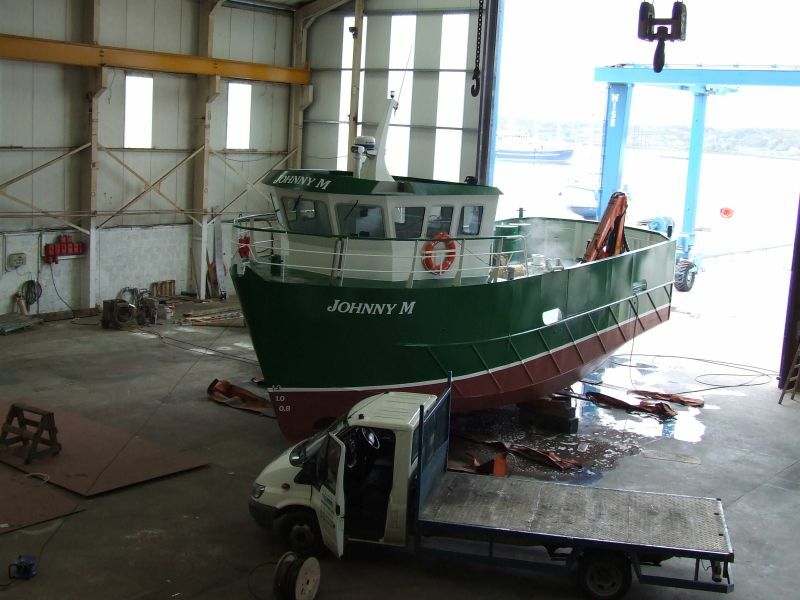 Jotun paint system supplied by Mooney Boats Ltd and the vessel was painted by Geard Bray & Sons. MG Duff Anode protection system has been fitted on the vessel and again supplied by Mooney Boats Ltd. 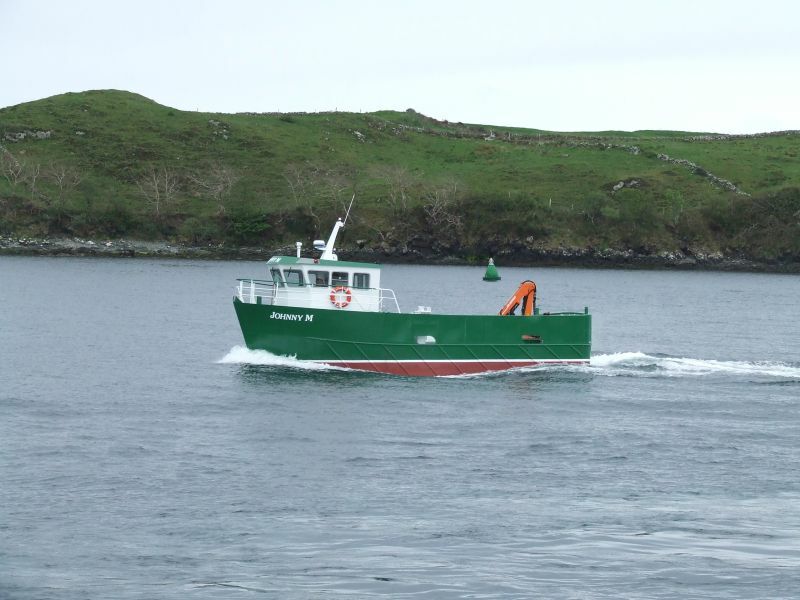 The vessel has been surveyed throughout the build by the Irish Marine Survey Office and will be licence as P 4 work boat.